The Enterprise Architecture Modeling Language as part of Dragon1 is a set of entity classes, symbols and rules for creating formal and informal models in the field of Enterprise Architecture. One of the advantages of using a modeling language for enterprise architecture is higher productivity, efficiency and unambiguity. Dragon1 in its core recognizes the following base class models: meta model, user model and instance model. The meta meta model consists most importantly of 'entity', 'attribute', 'relationship' and 'state' and with that and other constructus it defines the possible entity classes with which the Dragon1 meta model can be created, and so forth. The meta model defines concepts and relationships for conceptual modeling. 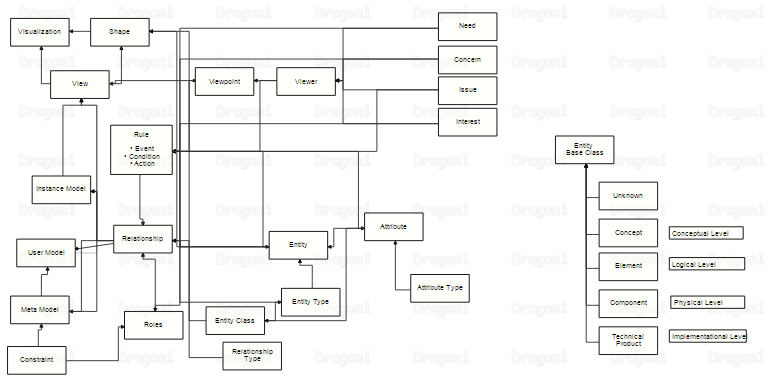 Dragon1 also defines rules on how you can extend the Dragon1 Meta Model with new specific entity classes. The Dragon1 open EA Method contains an Enterprise Architecture Framework with generic reference models and an EA modeling language. The reference models make use of the modeling language. Dragon1 as modeling language consists of 400+ entity classes or concepts. The download below contains the most recent and full list of these entity classes. Every entity class is defined and has its own symbol and modeling constraints and rules. Also various types of models, viewpoints, views and visualizations (diagram) are defined like an architecture view layout. If in your opinion an important generic entity class or concept used at organizations, enterprises or companies is missing in this list, please notify us via info@dragon1.com and we will take your suggestions into consideration at the Dragon1 Architecture Foundation. Dragon1 EA Modeling encompasses modeling at four levels of abstraction: Conceptual Modeling, Logical Modeling, Physical Modeling and Implementation Modeling. In the following paragraphs we will explain what the terms mean, what their relationship is and why you need them as architect. All is explained from the viewpoint of an architect.